Well, a lot has happened since my last post. I’m sure you’ve heard that legendary radio man Casey Kasem passed away early Sunday morning after a long illness. Like a lot of people, I spent a lot of my teenage years listening for his weekend broadcasts. If you like iHeartRadio, you can listen to rebroadcasts of his “classic” shows from the 1970s and 1980s. How do I know? Well, I’m listening to it, of course, and enjoying many of them. I think I started listening about 1975 or 1976, stopped in the mid-80’s and lost track of it all. He’ll live on in a lot of ways. Are you watching the World Cup? Me either. You’ll find out which one of your friends went to Europe for a summer. I mean, really–it’s a bunch of grown men strolling around kicking a round ball on the grass. I suppose it’s exciting, if you’re 8. The score is frequently ZERO. It’s soccer, not real American football, which involves body padding, serious injuries, mobile blood transfusions and a lot of caffeine. The NFL doesn’t have to produce 3 weeks of programming before the Super Bowl just to get people to watch it. At least there’s no loud, obnoxious horn in Brazil that will find its way out like the last time. We hope. Last week, I got a very nice note from Kraig (not “Craig,” oops) Barron of Deep South Blenders with thanks for a nice write up last week on their Cajun Seasoning. I like the stuff, and of course, I wasn’t going to say anything bad–why would I? Kraig was awfully nice to talk to me about it, too. They are working to making more of their products available in the much larger Houston market, so. . .if you want to try it, go buy some! You’ll love it, especially if you’re having a crab boil. This weekend I did some sewing, too, including a small birthday present for Neighbor K (who should have found it by now on the breakfast bar; I left it there after walking the Pug.) 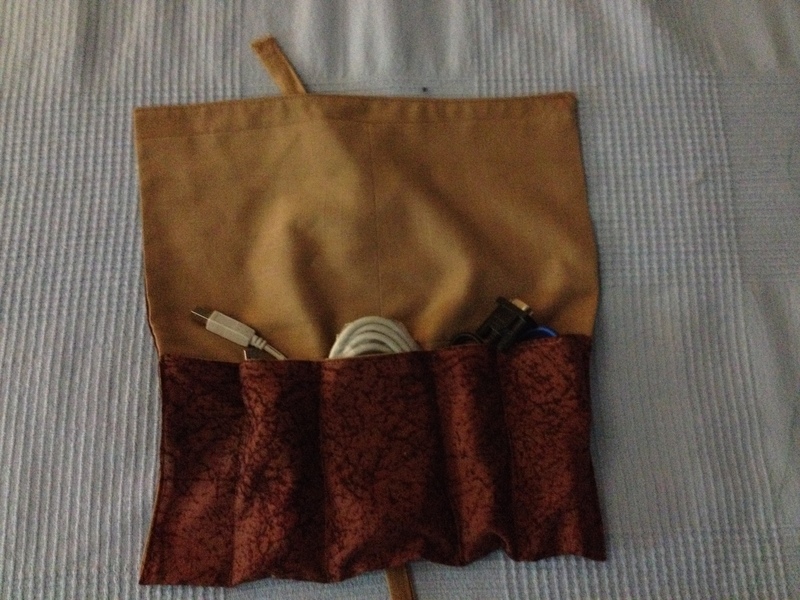 I didn’t take pictures of it, but I did take some of the cable cozy I made with a fat quarter and some stitched-up pieces of leftover linen. You know you need one, right? Neat, huh? Holds cables and cords in a neat little package. Nicely kept in one place, neat and tidy. 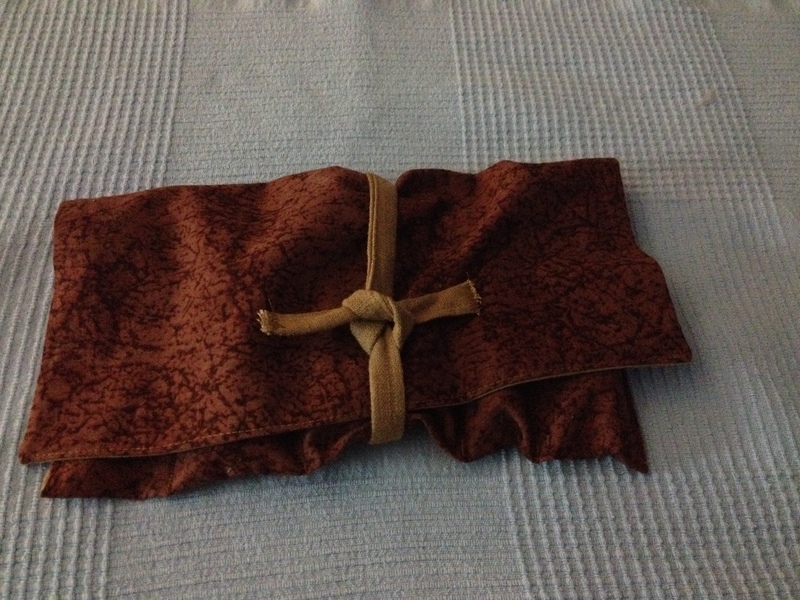 The linen has seams because it wasn’t cut from yardage–I literally stitched stuff up, just to use it up. I offered it to the GER, but he passed. He said it would get messed up, but I suspect it was more like he has more cords and cables than he knows what to do with. He’s a guy. The GER had an adventure with one of his friends yesterday–they went north of Conroe to go berry picking. Two manly men picked and indeterminate number of blueberries. AND–I was gifted with a big bag of them myself. I LOVE berries, and these were literally freshly picked. He said he got up at 4:30 and DROVE up to the country. That has to be at least a 2 hour ride from his house, even very early on Sunday morning. He said it was way up in the country, where it was absolutely beautiful. That’s when I started dreaming about a country place again. Oh, yeah. I got the new issue of Urban Farm magazine today, too. Well, anyway. . . . The GER said they ate more than they picked, and I can believe that. He was given strict instructions by the husband-and-wife farmers not to wash them until you’re ready to use them, even if you’re freezing them. Seriously. I did as instructed, and froze them as Martha Stewart would tell you to do–in a single layer on a baking sheet. I had to do it in shifts, since I have a small freezer. 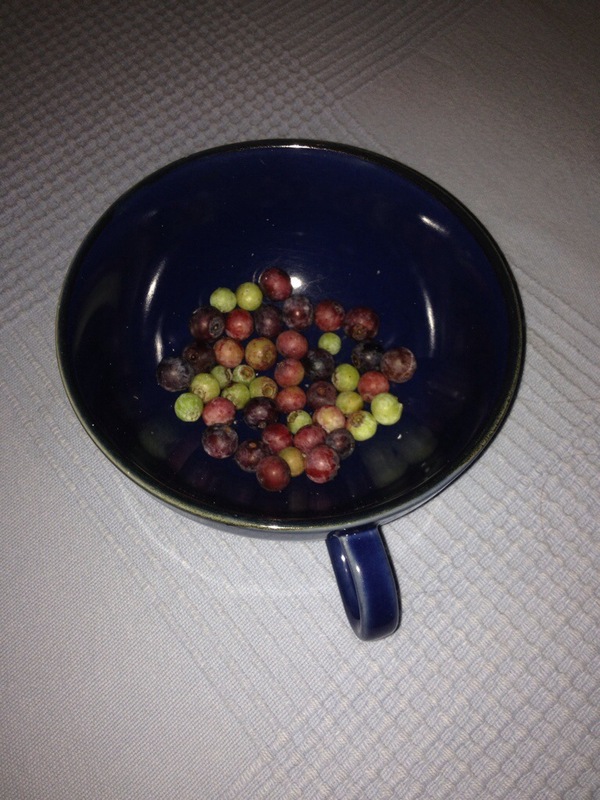 That’s OK. Of course, I had to pick all the stems and unripe ones out of the batch–but do you think I minded doing that? No way. I did find an itsy-bitsy spider in the last batch, but I figured he’d come all the way down to my place, he deserved to be shown a good time. So he took a free tour of the city. If you just toss them into a bag, they will crush under their own weight and you’ll end up with a big, blue frozen mess. How do I know? I’ve done it–how else? This is what didn’t go into the freezer. No, not the cat food. Oh, yeah, that little roundish plastic thingy is what holds my iPhone while I’m in the kitchen. I was listening to an American Top 40 broadcast on iHeartRadio. Except when I was taking pictures. So, it took a little while, but they all ended up in the freezer. Well, what was left after I was washing and eating handfuls of them. Oh, they were so good. While the first batch froze, I picked apart the second, and that’s when I found the spider. I also wondered what the heck I was going to do with these, but it didn’t take much thought. I want some ice cream. Seriously. Specifically, home made ice cream, and I know which one. Blueberry Swirl Cheesecake Ice Cream. More on that later. I got them all packed up and stuck in a little corner of the door. OK, admittedly, this is what was LEFT of them. I couldn’t stop eating them, either. Remember all those I picked out, the unripe and imperfect ones I took out of the freezer batch? I didn’t toss them. I figure, they’ll ripen eventually, right? So far, so good. The ones left behind. I’ve been eating them as they ripen. Happily. You can Google up a recipe for it, but I’m going to give you THE only recipe you need for this ice cream, just in time for July 4th. And it comes from. . .the July-August issue of Martha Stewart Living. See why I keep them? Now you’re probably thinking, “I can just look it up on the website, can’t I?” Actually, no, you can’t. Let me tell you why–out of the big article on blueberries, and the myriad of related recipes, this particular one was buried in the recipe section with recipes from the article, but not mentioned anywhere in the article or anywhere else in the magazine–even though there’s a separate recipe for Vanilla Ice Cream 101. The only way to find it is to actually read ALL the recipes, like I did. I made it and loved it, and made it again for. .. ah, my final husband. I was going to my 20th high school reunion, and made him two batches of ice cream, the vanilla and this one, plus a couple of other things to enjoy while I was in New Orleans. He looked at it and didn’t know what to make of it and never touched it. He liked it when I got home and told him what it was, though. I’m not married anymore, and I don’t have to share my ice cream!! In this article on blueberries is a recipe for what they called the Blueberry Buckle, a traditional American fruit-filled cake with a big, heavy streusel topping on it. I did make it, one time, I think for a Buddhist meeting, and it was SOOO delicious. But the ice cream has remained a hidden jewel. I mean to ask MSL why, but I never get around to it. That recipe *is* on Martha Stewart’s website, and you can see the original video segments of Martha making this with her late mother, Martha Kostyra (do a search on her site for “Blueberry Buckle” and all three come up.) I haven’t watched them, but I believe I remember Martha asking her mother about using frozen blueberries, and Big Martha said, “Don’t.” I listen to Big Martha. So, for this recipe you will need something called creme fraiche, which you can make yourself or buy pre-made. Trust me when I tell you I didn’t grow up with it, and only know what it is from being a Martha fan all these years. There are recipes in many of Martha’s books, but I prefer the easier method in one of Suzanne Somers books–one part sour cream, one part heavy cream, stir or shake, and leave at room temp for 8 hours, then refrigerate. However, I think I made too much, so there may be a *new* recipe to use it up. This ice cream, good as it is, doesn’t make a whole lot, but a little goes a long way. Rich, sweet and delicious, and full of the bluest of berries. 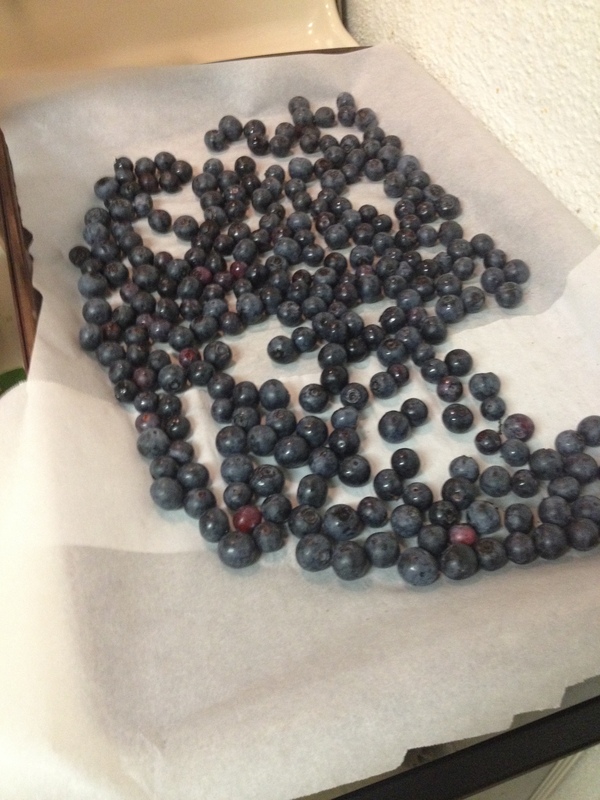 So here goes–one of the best uses of freshly picked blueberries. . .ever. Maybe I’ll even invite the GER over for some. Oh, wait, he says he’s on a “diet.” Right. He’s rail thin as it is, and if he loses any more weight he’ll be hospitalized for anorexia. Oh, nevermind. . .here you go, and make sure that ice cream maker works, OK? In the bowl of an electric mixer fitted with the whisk attachment, place 3/4 cup sugar, cream cheese, and creme fraiche. Whip at medium speed until smooth, about 1 minute. Add the egg and vanilla, and mix on low speed until combined, and set aside. In a medium saucepan over medium heat, bring milk and cream to a low simmer until just steaming, about 3 minutes. With mixer on low, add half the warm milk to the cream-cheese mixture. When combined, add mixture back to saucepan. Stir mixture constantly over medium heat until thick, 4 to 5 minutes; do not allow mixture to boil. Fill a large bowl with ice water. Pour cheesecake mixture through a fine–mesh sieve into a medium bowl set in the ice bath; stir occasionally until cooled. When cool, place mixture in an ice-cream maker; process according to the manufacturer’s directions. While ice cream is freezing, heat blueberries and 2 tablespoons sugar in a saucepan over medium high heat. 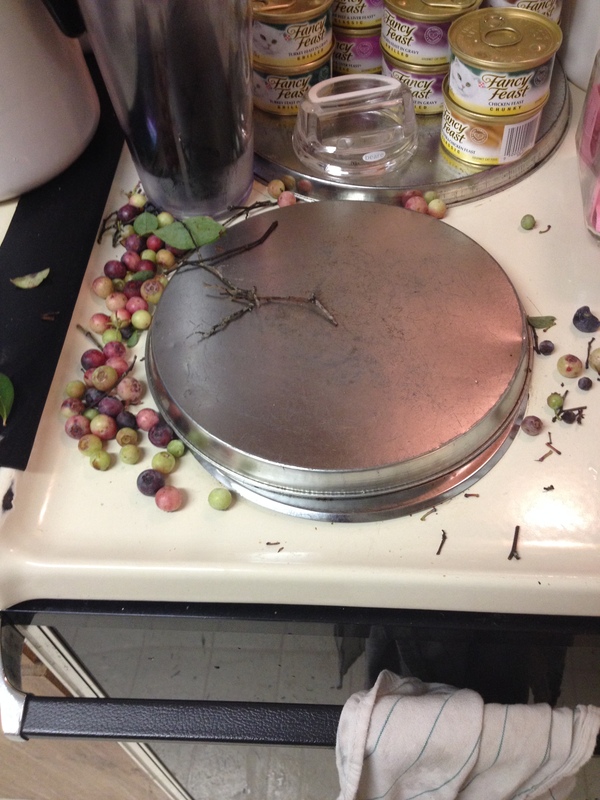 Smash half the blueberries while cooking. Cook until thick and syrupy, about 3 minutes. Remove from heat, allow to cool. Remove half the ice cream from the machine, and transfer into a low-sided 2-quart container. Using the back of a spoon, smooth ice cream over the bottom of the container. Spoon half the blueberry mixture over the ice cream, and repeat the process. Spoon the remaining blueberries over the top of the top layer of ice cream, and cover. Freeze overnight, or until firm. Having done this many times, I strongly suggest a layer of plastic wrap on top the ice cream, THEN cover it. No ice crystals that way. . .unless that’s your thing. The next recipe in the magazine is Blueberry Sorbet, which is similar to this one except it adds the juice of half a lime. If you actually have this magazine, it’s on page 226. Definitely a keeper. Oh, and if you’re considering buying an ice cream maker, I would like to offer you a couple of suggestions. The ice cream maker I have is great, BUT–you have to freeze the insert before you can make the ice cream. That’s fine, but if you have a small freezer like I do, it can be problematic. (Enter Neighbor K’s mostly empty freezer.) You can actually buy extra bowl for this machine, but. . .it’s only good if it’s already FROZEN!! In my dreams I see a side-by-side, stainless steel exterior, and all the amenities, but no computer chips. Lots of room to freeze anything I want. I suggest a plug-and-play ice cream maker, which I wish I’d bought originally, but I was being cheap. What’s the difference? In the first machine, the frozen insert does the freezing of the ice cream. (If you have a KitchenAid stand mixer ice cream maker attachment, the bowl-freezing step is the same.) With the plug-and-play version, the internal compressor takes care of all that, just like in a commercial kitchen, so you don’t have to plan too far in advance, empty out your small freezer or borrow your neighbor’s for 12 hours. A LOT more convenient. . .next time, I’ll get that one, darnit. Can we call that a hot mess, even if it was frozen? Either way, never again. You remember that, don’t you, GER? So when blueberries are in season, or on your mind, please don’t drown and destroy these delicious berries with Cool Whip. Eat them raw, toss them in a smoothie (remember what I said about that last year) or freeze them until you make up your mind. Hurry up, while blueberries are in season!! Now that I’ve told you everything you need to know about blueberries AND ice cream makers, go for it! Yes, grocery store ice cream can be great, but once you’ve tasted real, homemade ice cream, you’ll wonder how you ever got along without it. Get a good book–either my favorite, or find one of your own, and post it in the comments. 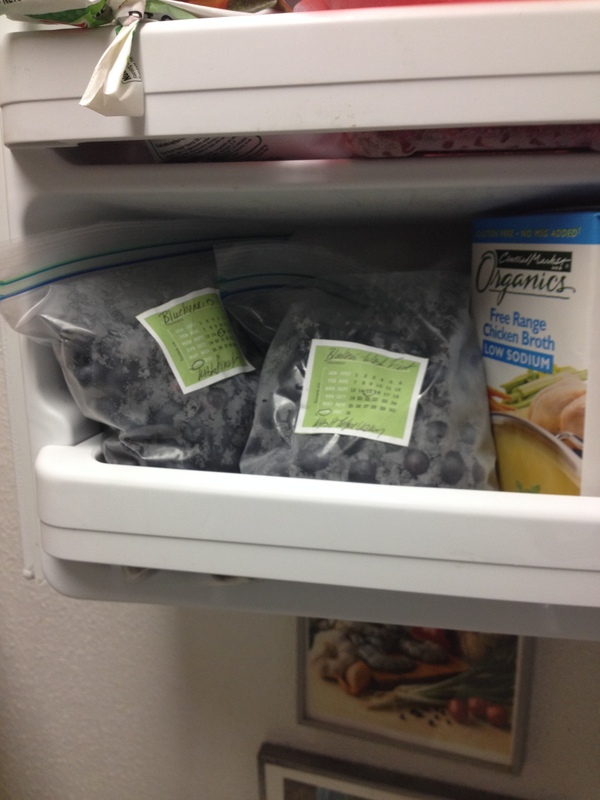 It’s summer, and time for blueberries and ice cream. Enjoy! !